FLOWER MOUND, Texas | Frances Carmela Graceffo, 95 years of age, passed away peacefully on Tuesday, Oct. 2, 2018. Frances was born, raised, and lived in Auburn until 2017, when she relocated to live with her niece and family in Flower Mound, Texas. During her entire lifetime, “Fran” was known to be a kind, gentle, and loving woman, devoted to her family, friends, and St. Francis Parish. She graduated high school in 1940, and entered Auburn Business School, where she became qualified for the various administrative assistant positions she held until her retirement. Most notably, her time at the former DairyLea plant in the west end of Auburn was treasured by the many young nieces and nephews in her life (as she often brought home frozen treats for all to enjoy). She also enjoyed many years of working in the Civil Service Department at the Cayuga County Office Building, where she made life-long friends. After retiring, Fran served her community as an officer of the Sacred Heart Society, member of the St. Francis Parish Council, and general volunteer for many church-related functions and events. Fran enjoyed traveling, including a dream-trip to Italy with her sisters and cousins. She made several trips to Las Vegas, and later to Niagara Falls and Turning Stone. She visited Texas many times prior to relocating there. Her love of playing cards was a highlight, and she enjoyed many games with sisters, Nora, Fran, and Joan, and close friends, Norma Guariglia, Peter, Josephine, and Peter Sikora Jr. Lifetime friends, the Contiguglia’s and Locastro’s were with “the girls,” every Friday night for coffee and dessert. She was also a needle-crafter, creating many fine afghans and sweaters, still appreciated by her loved ones. She loved tending the backyard garden, producing an abundance of flowers. She had a quick smile, a keen mind, and a fashion-sense that was admired by many. Fran was often complimented (well into her 90s) for her youthful appearance and general good health, which she ascribed to living a clean lifestyle, never smoking, and getting plenty of fresh air and exercise. Although the pain of arthritis took hold, and her eyesight had failed, Fran never complained. She remained an inspiration to all with her delightful sense of humor and positive outlook on life. Fran was predeceased by her parents, Antonio and Asunta (Paxhia) Graceffo; her beloved brothers, Dr’s. Frank and Joseph; sisters, Nora and Susan “little Sue”; sister-in-law, Billie; niece and God-daughter, Susan (Graceffo) Draina; nephew, Joseph “Big Joe” Graceffo; and many close aunts, uncles, and cousins. She is survived by her sister-in-law, Joan (Sikora) Graceffo (wife of the late Dr. Joseph F. Graceffo), and their children whom Fran thought of as her own – niece, Ann Marie (Graceffo) Martin, of Flower Mound, Texas; nephew, John, of Columbus, Ohio; nephew and God-son, Joe Graceffo, of McDonald, Pa., and their families, Patrick and Joseph Martin, Jennifer, Wesley, Cameron, Mia, and Nico Graceffo, Dr. Sarah Graham; her brother, Frank’s children whom she also loved, Dr. Tony (Paula), Elaine, Frank, and Dr. Michael Graceffo; Francine (Bob) May and all of their children and grandchildren. She will be most lovingly remembered and dearly missed by all those blessed to have had her in their lives. Calling hours will be from 3 to 5 p.m. Sunday afternoon, Oct. 14, at Pettigrass Funeral Home, 196 Genesee St., Auburn. A Mass of Christian burial will be celebrated at 10 a.m. on Monday, Oct. 15, in St. Francis Parish, Clark Street, Auburn. 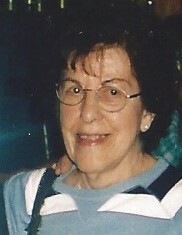 Donations in Fran’s memory can be made to The Matthew House, St. Alphonsus Food Pantry, or Hospice of the Finger Lakes.